Ricoh has launched its new Ri 1000 direct-to-garment (DTG) printer to help support companies already established in the market and also businesses moving into this sector for the first time. Boasting a resolution of 1200 dpi x 1200 dpi and support for CMYK plus white ink, the new machine replaces the existing Ri 3000 model. It joins both the Ri 100 and Ri 6000 in Ricoh’s DTG portfolio of solutions. 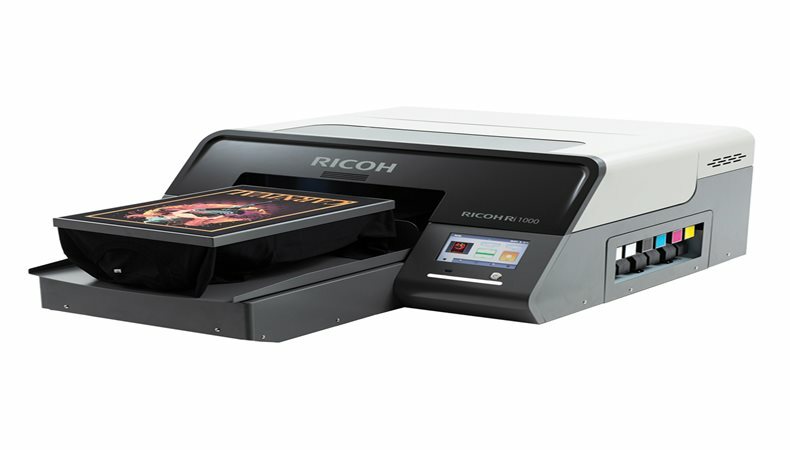 The Ri 1000 can switch between multiple styles of platens up to 406.4mm x 508mm, while Ricoh said its magnetic mechanism enables the platens to snap on and off without the need for additional tools. In addition, users will benefit from a new pre-treatment liquid, which Ricoh said it suitable for 100% light polyester and polycotton blends. The manufacturer has said this will help open up more opportunities for garments and textile products in key growth sectors such as sportswear. Speaking to FESPA.com about the machine, Simon Isaacs, national sales director at Ricoh UK, said the Ri 1000 offers an effective solution to all types of company active in the DTG sector. “The Ri 1000 is targeted at new and existing garment printing businesses, such as garment decorators, digital printers, screen printers, commercial printers and even fashion companies, schools/universities or corporations are expected to find the Ri 1000 a great addition to their business capabilities,” he said. In terms of the impact the Ri 1000 will have on the wider DTG market, Isaacs said he expects the machine to prove popular with businesses right across the sector. “The DTG printing market is growing and we are confident that the Ri 1000 will be warmly received by a diverse range of progressive businesses,” Icaacs told FESPA.com. “Since we strategically integrated our inkjet technology into our own printing solutions, we have looked intently at the market in terms of how we can lever the creative minds of Ricoh to make innovative technology available to our clients. In turn, that technology allows our clients to enter new markets, improve their margins and grow their business. Industry members keen to learn more about the new Ri 1000 printer can see the machine in action on the Ricoh stand at the 2019 FESPA Global Print Expo, which runs from May 14th to 17th in Munich, Germany. FESPA Global Print Expo 2019 is Europe’s largest speciality print exhibition for screen and digital wide format print, textile printing and signage solutions. Visit Ricoh at stand K31 in Hall B4 at the Messe Munich between the 14-17 May 2019 and discover the available features. Please use promo code FESG902 to register for free.